UPDATE: Hey Butterflies! So you know how I posted about not visiting a water-park since 2001? Well, I finally went to Schlitterbahn and had an awesome time. We originally tried to visit the park the second weekend in June, we got all the way up to guest services and was told that due to the lightning (it was raining) most of the rides/pools were closed and that the park would be closing in two hours so we decided to just leave and try it again another day which we did. We tried it again the weekend before last while on our annual Texas Summer Road Trip and this time we got to the park a little earlier, it opened at 10am but we didn't get there until about 1pm and there was no where to park. After driving around the parking lot for like 20 minutes we finally were able to wait on a car leaving to get a spot. We packed a lunch because Schlitterbahn allows guest to bring in outside food and drinks, awesome right? The park however doesn't allow in any alcohol or glass containers so be prepared to have your bags and coolers searched. If you feel the need to, you can purchase alcohol from the park but I'm sure it'll cost you more than usual per can. I noticed almost everyone was just leaving their belongings on the picnic tables but you can also rent a locker for $8 (you get $2 back with key return) which is what we did just to be on the safe side. The lines were long pretty much all day for most of the slides so I spent most of my time in the lazy river, you could literally float around all day. Even though we packed a lunch, we decided to try the park's food just for the sake of the experience. I made the mistake of ordering chopped beef nachos from one barbecue shack there and take it from me because I'm a nacho expert..those were not nachos. They were ok but really sweet due to the barbecue sauce I'm guessing, anyway they were gross but I heard the chopped beef poboy and baked potato were great. We left about 20 minutes before they close (which is 8pm) after picking up our pictures. What a great experience! Aloha my summertime loving Butterflies! 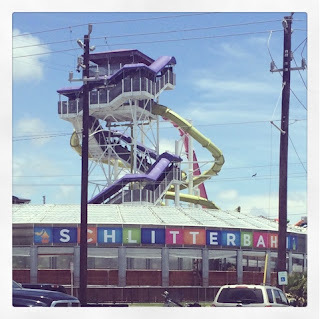 Since carnival and water-park season is in full effect, lets talk Schlitterbahn. Built in 2006, Schlitterbahn Galveston Island Waterpark is the third waterpark in the Schlitterbahn family of parks. This 26-acre waterpark features more than 33 attractions, designed to have something for every age like: inland surfing on the Boogie Bahn if you want an ocean like experience, splash zones for the little humans and connecting the Kristal and Torrent Rivers, Schlitterbahn has a mile long Transportainment River system, which allows guest to float throughout the entire park without ever leaving the water. To celebrate its 10 year anniversary, Galveston will be unveiling a new ride this summer, which will be the world's tallest water coaster - MASSIV! What's a Water Coaster? A water coaster is a water ride that has multiple uphill sections, uses a ride vehicle (boat, tube, or raft), and has other ride elements (spirals, fish ladders, water screens, etc.) to deliver a thrilling and fun filled ride. I haven't been to a waterpark since I was a teenager and Astro/Water World was still open in Houston. This summer's trip to Schlitterbahn will mark my first trip to a waterpark as an adult and I can't wait. Making Memories at Schlitterbahn has been part of hundreds of thousands of great memories for guests - What are your favorite memories at the park? Please visit Schlitterbahn.com for more information about the Schlitterbahn water-parks! Water parks are so much fun, looking forward to it this summer. Great tips!